Ivy Katz has a Master’s Degree from in Counseling Psychology from Lewis & Clark college, as well as completing their Ecopsychology certificate program. Ivy has a bachelors degree in Human Development with a focus in the therapeutic use of Adventure Education as well as Dance from Prescott College. She has worked in the mental health field since 2007. Prior to working at the Center at Heron Hill she spent several years working for a few different wilderness therapy programs, and gained competence and passion in working with clients from an ecopsychology framework. Ivy has completed several professional trainings in somatic, mindfulness based and experiential approaches to therapy. 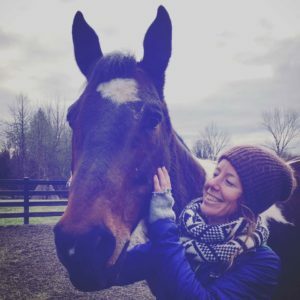 This includes training in Hakomi Body Centered Psychotherapy, CIMBS (complex integration of multiple brain systems), trauma informed yoga, and Natural Lifesmanship’s trauma focused equine assisted psychotherapy. Ivy also travels the country regularly leading Trauma informed yoga trainings for the non-profit Street Yoga.